Playing namby-pamby is not Sam Rockwell's strong suit. Rockwell is a hugely charismatic and versatile actor–the kind of performer whose name you're always happy to see in the opening titles of a film–but what makes him so interesting is the sense of danger and unpredictability he brings to a role. He's a wild card. He's a troublemaker. He's the most charming rogue. As a put-upon, small-town pharmacist in "Better Living Through Chemistry," though, he's stuck playing a nice guy who's a bit of a dud. The point of this dark comedy is the transformation his character, Doug Varney, undergoes with the help of pharmaceuticals and a femme fatale. Once he finds his mojo, though, it's a fleeting and not entirely convincing sight to behold. Like Doug's newfound brazenness, "Better Living Through Chemistry" as a whole feels rather superficial and safe. First-time writer-directors Geoff Moore and David Posamentier have amassed an impressive cast; Olivia Wilde in particular enjoys some lively chemistry with Rockwell as the dangerous, married woman who serves as Doug's guide to the dark side. It's just a pity they don't give their players more to do. Jane Fonda, for example, is spectacularly misused as the film's narrator. (We only see her once, briefly, even though she's supposed to be a frequent customer.) Fonda is forced to spell everything out in heavy-handed and pervasive voiceover: "He was good at what he did," she says of Doug. "I saw it every time I came in." And she delivers the story's cloying, cringe-inducing moral at the end. Doug has allowed everyone to bully him for years. His wife, Kara (Michelle Monaghan), is a demanding and demeaning workout fiend. Cycling, boxing, yoga, vitamins—that's her drug of choice. The couple's sullen 12-year-old son, Ethan (Harrison Holzer), is a wannabe ninja who rejects Doug's attempts at closeness. But his chief oppressor is his father-in-law (Ken Howard), who also happens to be his boss. Even when he retires and hands the pharmacy to Doug, he keeps his own last name on the front window. In no time, Elizabeth and Doug are drinking wine by day and cavorting in the back seat of her Mercedes Benz convertible by night. When Elizabeth suggests that they start dipping into the store's stash, not only does Doug not hesitate, he starts mixing some drug cocktails of his own. The montage depicting his liberation at the hands of this subversive angel should be self-explanatory, but once again, the Fonda voiceover intrusively informs us about what we're watching. Then Elizabeth suggests in passing that the couple should just kill her financier husband (Ray Liotta, strong in just a couple of scenes), make off with his money and start a whole new life together. It's the ultimate film-noir premise. 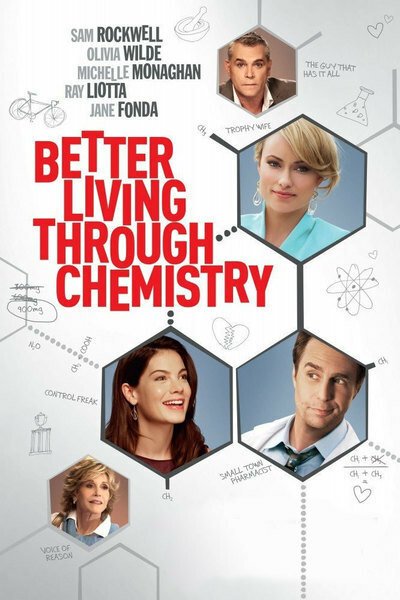 But as "Better Living Through Chemistry" makes this tonal shift and the tension should be heightening, the movie actually starts running out of steam. A subplot in which a sweetly bumbling DEA agent (Norbert Leo Butz) starts snooping around and noticing discrepancies in Doug's inventory also lacks the necessary suspense. "Better Living Through Chemistry" is never mean enough or joyous enough. The naughtiness that's supposed to be providing us vicarious thrills is at odds with the preachy, moralistic narration from Fonda's character. The result is the cinematic equivalent of maintaining a slight buzz.